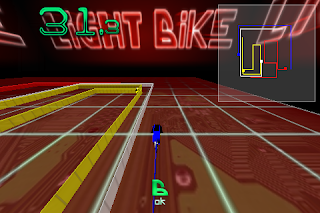 LightBike Free [iTunes link] - This is a cool TRON-inspired game. You control your lightbike by tapping on the screen. The control is not very responsive but after a while you get the hang of it. The full paid game is $.99. Touch Physics Lite [iTunes link] - A game in the vein of Crayon Physics Deluxe. It is very challenging and I have yet to finish all 6 levels. I suppose there will be a paid version of Touch Physics in the future. I have Touch Physics (The full version) and it is awesome! It's the perfect game that you can pick up or set down at a moment's notice. My kids love it too. Great pick and highly recommended. Another similar game that I like is called Jelly Car. It also uses a real-physics engine. Have fun! !